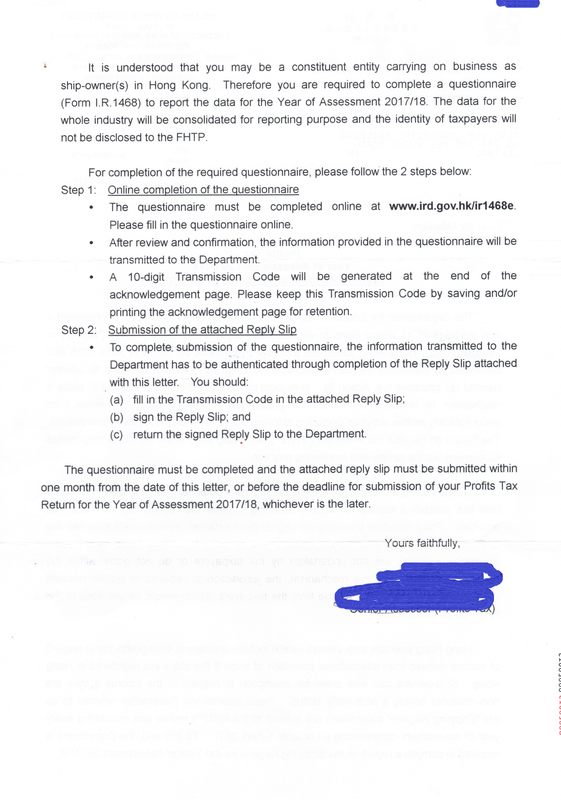 "Subject to the provisions of this Ordinance, profits tax shall be charged for each year of assessment at the standard rate on every person carrying on a trade, profession or business in Hong Kong in respect of his assessable profits arising in or derived from Hong Kong for that year from such trade, profession or business (excluding profits arising from the sale of capital assets) as ascertained in accordance with this Part." "profits arising in or derived from Hong Kong for the purposes of Part IV shall, without in any way limiting the meaning of the term, include all profits from business transacted in Hong Kong, whether directly or through an agent." The Revenue (Profits Tax Exemption for Offshore Funds) Ordinance 2006 (the 2006 Ordinance) was enacted in March 2006. The Exemption Provisions exempt non-resident persons (including individuals, corporations, partnerships and trustees of trust estates) from tax in respect of profits derived from certain specified transactions carried out through or arranged by specified persons. (f) a transaction in exchange-traded commodities. A specified person normally is a corporation licensed or an authorized financial institution registered under the SFO for carrying on a business in any regulated activity as defined by Part 1 of Schedule 5 to the SFO. @ the Inland Revenue (Amendment) (No. 2) Ordinance 2015 (the 2015 Ordinance) was enacted to extend the profits tax exemption for offshore funds to offshore private equity funds. The 2015 Ordinance has amended the definition of “securities” in Schedule 16 to the Ordinance so that a transaction in securities of an SPV or an excepted private company is a “specified transaction”. Financial Institutions are not eligible to be a qualifying corporate treasury centers. Entering into qualifying corporate treasury transactions for associated corporations. Only profits derived from those activities in realtion to non-HK associated corporations may be eligible for the concessionary tax rate. Should have sufficient business substance in Hong Kong (Corporate Management Center must be exercised in Hong Kong). 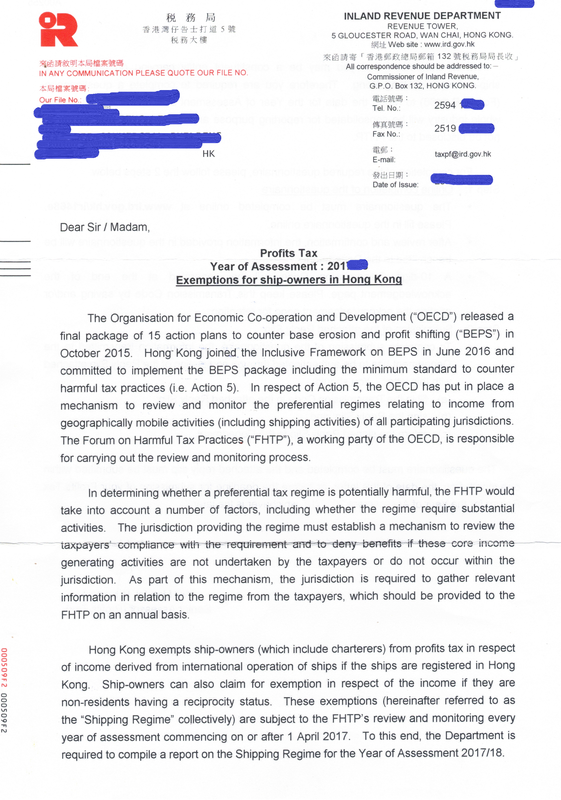 Income for ship within the water of Hong Kong is relevant sum (Ship registered and managed in Hong Kong but income not generated within "Hong Kong's water" not taxable). that person shall be deemed to be carrying on that business in Hong Kong. Subject to subsection (6), where a person to whom subsection (1) does not apply carries on a business as an owner of ships, and any ship owned by that person calls at any location within the waters of Hong Kong, that person shall be deemed to be carrying on that business in Hong Kong. Subject to subsections (4) and (5), where a person is deemed to be carrying on a business as an owner of ships in Hong Kong under subsection (1) or (2), as the case may be, the assessable profits of that person from that business for a year of assessment shall be the sum bearing the same ratio to the aggregate of the relevant sums earned by or accrued to that person during the basis period for that year of assessment as that person’s total shipping profits for the basis period bear to the aggregate of the total shipping income earned by or accrued to that person during that basis period for that year of assessment. Not all "Voluntary" or so-called "non-profit-making" organisations are charities, however worthy their causes may be. In fact, there is no provision in the Inland Revenue Ordinance which exempts a "voluntary" or "non-profit-making" organisation from tax. Generally speaking, for an institution or a trust to be a charity, it must be established for purposes which are exclusively charitable according to law. The law defining the legal attributes of a charity is based upon case law developed through court decisions. d. other purposes of a charitable nature beneficial to the community not falling under any of the preceding heads. While the purposes under the first three heads may be in relation to activities carried on in any part of the world, those under head (d) will only be regarded as charitable if they are of benefit to the Hong Kong community. A purpose is not charitable unless it is directed to the public or a sufficient section of it. An institution cannot generally be charitable if it is in principle established for the benefit of specific individuals. It is, however, not possible to lay down any precise definition of what constitutes a sufficient section of the public. Each case must be considered on its own merit. k. Protection and safeguarding of the environment or countryside. d. Encouragement of a particular sport such as angling or cricket. Seems cause of 2017/18 legislative council hot discussion topic, IRD focus on Directors' Remuneration of Charitable Institutions & Trusts. Your attention is drawn that all income and property of a charity shall be applied solely for furthering its charitable objects. It is thus important for charities to maintain reliable internal controls and accounting system so as to safeguard the assets from being exposed to risks. (b) the work in connection with the trade or business is mainly carried on by persons for whose benefit such institution or trust is established. [PS: seems Guang Dong Province, Mainland, PRC does not allow “contract processing” (來料加工) anymore so that here just for reference only. The reference value can be on when your HK company has an assets used by a subcontractor in Mainland, PRC, how much allowance can be claimed in the HK company's HK tax computation, relating to Section 16(G) of IRO. For “contract processing” (來料加工) arrangements, recognizing the operations of the Hong Kong company in the Mainland, an apportionment of profits on a 50:50 basis is usually accepted.